A little island of calm in a troubled world. After completing a small rural village I wanted somewhere to have a change of scene for games of Ronin. Besides, my sohei warrior monks needed some home turf to defend. At Salute I also picked up some of TT Combat’s nice cheap walls so I’d like to do a walled temple, but for now this collection of bits will do nicely for a small shrine on the road to somewhere. The torii gate is an iconic piece of Japanese terrain, so much so that people tend to plonk them down on any old table, but they’re actually supposed to be part of the entrance way to temples. Here you can see all the layers building up the gate that have to be sanded smooth. 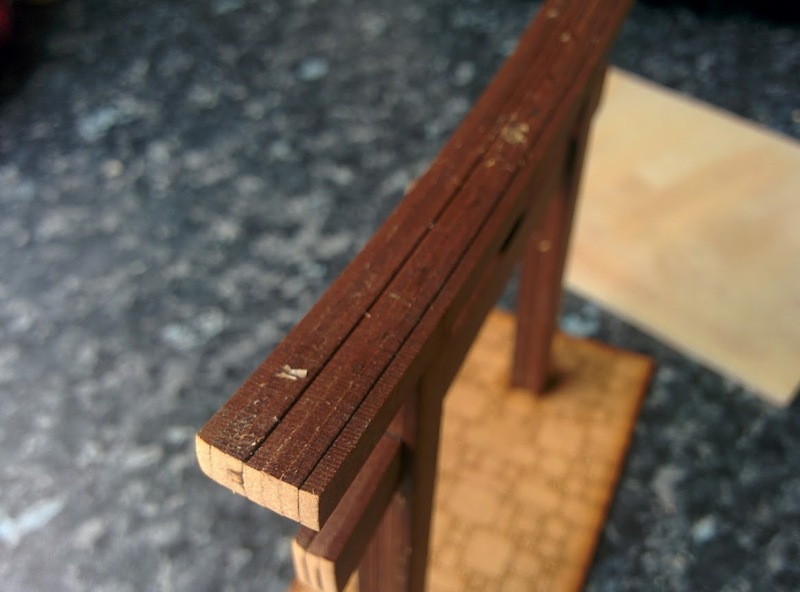 The Sarissa gate is built up from five layers of MDF slapped together. No matter how careful you are when aligning them you’re bound to get a layered texture down the sides, and the MDF has the slight ripple texture from the laser anyway. So after assembling the gate I attacked the edges with a sander and some files and managed to get them mostly smooth. You’ll especially want to do this along the top surface, or it’ll stick out like dog’s balls on the table. Even with a bit of faff this is a pretty quick piece to build, and only requires a really simple paint job. After a nice bright red and a bit of a dab with some black and brown on a sponge it was a bit of basing and job done. The main building here is a “Small Minka” from TT Combat. A minka is a house, but I think it works perfectly well as a small shrine. The kit is very cheap, you’ll get change from £7! This buddha statue is just stuck down with a magnet so it can be removed to place figures inside. I added some plastic cross-stitch canvas to the outside to break it up a bit, and corrugated cardboard to the roof, as the etched-on tile texture is a bit pants. The default roof is pretty naff. I’ve added strips of corrugated cardboard. 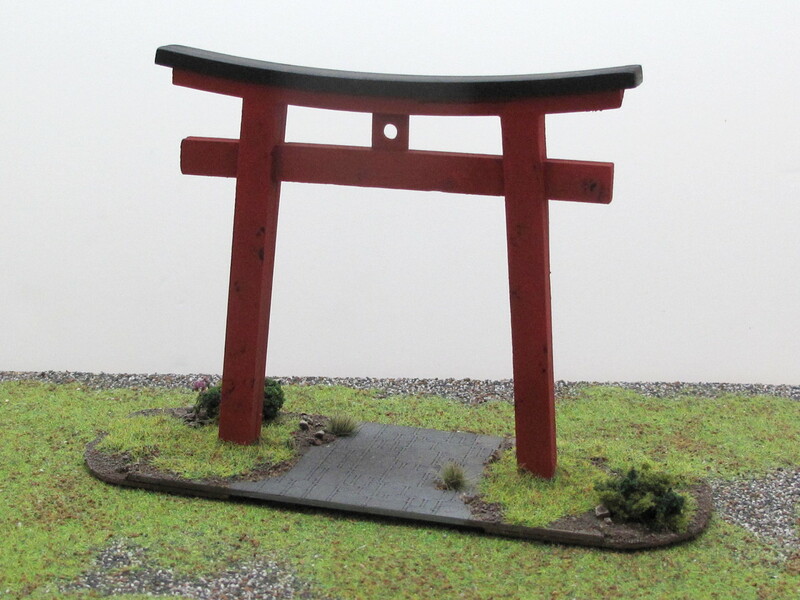 The zen garden and temple dogs are from Wargames Terrain Workshop. They’re resin pieces. The zen garden comes with the sand as one piece and the rocks separate, so painting is a doddle. The trees are just Woodland Scenics armatures and Olive Fine-Leaf Foliage, with a bit of flock sprinkled on top. I’ve got a big bag of them, as I wanted to make some orchards at some point, but they keep finding their way onto terrain pieces in the meantime. The headstones are from Plastcraft. Don’t be fooled by the name though, they’re also resin. Pretty straightforward stuff, I didn’t want to make the graveyard too fancy. Looking at pictures real Japanese graveyards they tend to be pretty unassuming, with no fences. I wanted there be enough room for figures to fight, too!